This Exchange explains how the EverGraze principles can be applied for improvement of pastures to meet farm business objectives. The process applies to both existing pastures, as well as long-term planning for selection and establishment of new pastures. Regional packages provide more specific information with examples from research and on-farm case studies for which pastures and grazing practices suit local landscapes and enterprise needs. For extensive beef and sheep systems, pastures are the backbone of the enterprise and in most years, over 90% of livestock energy requirements come from the pasture. Increasing the amount of pasture grown and/or extending the time that quality herbage is available will result in a higher stock carrying capacity, higher reproductive performance, lower supplementary feeding requirements and higher net profits. Pastures also play an important role in balancing water use and maintaining ground cover thereby managing environmental issues such as salinity, erosion and soil acidity. Having more productive and nutritious pastures can improve animal health and reduce stress on the owner/manager. Perennial pastures are costly to establish and typically take 3-8 years to return the initial financial investment when full consideration of establishment costs; purchase of additional stock to consume extra feed; interest on loans and funds invested; and increased maintenance fertiliser for higher stocking rates are accounted for (the time may be less under a mixed cropping scenario). It is therefore essential that the decision to sow a new pasture (rather than improve an existing pasture with fertiliser and grazing management), is carefully considered, and that the species selection, establishment and management maximises persistence, production, return on financial investment, as well as gains towards meeting environment and risk management objectives. Knowing which pasture species suit your soils, topography, management and enterprise needs is critical to making these decisions. Consideration should also be given to strategic changes to the enterprise setup and infrastructure; and tactical management that may be needed to maximise return on investment. For example, to maximise return from investing in lucerne, strategic changes may include a later lambing time, higher stocking rates and additional fencing for rotational grazing to ensure persistence. Tactical decisions may include whether to graze the additional green feed with ewes or lambs given current season and market conditions. The EverGraze principles summarise the considerations for selecting and managing perennial pastures. Applying the principles on the EverGraze Proof (research) Sites resulted in increased profits, improved environmental management, reduced risk of negative margins in poor years and greater opportunities to benefit from good years. The right perennial plant put in the right place for the right purpose with the right management improves profitability, risk management and natural resource management simultaneously. The right combination of perennials across the farm and tactical management creates flexibility and reduces seasonal risks while creating buying and selling opportunities. Investing in perennials needs to be combined with highly productive livestock and optimum tactical management to achieve the profitability, environmental, risk management and lifestyle objectives. The following sections outline general considerations for applying these principles to pasture improvement. For more specific recommendations for your region, see the regional packages. A good starting point when considering pasture improvement is to assess the current pasture performance relative to enterprise and environmental requirements. The need to invest in pastures may arise from poor performance of existing pastures; a change in livestock requirements (eg. a need for higher quality feed to finish lambs in late spring); a desire to increase profitability; or identification of opportunities to capitalise on species developments – such as more winter active lucerne varieties or improved perennial ryegrass endophytes. The three steps below provide a summary of the process for identifying opportunities for pasture improvement. The EverGraze Exchange on Making strategic decisions provides templates for completing these steps for your farm. Guided by application of the EverGraze principles (explained in the sections that follow), a 5 -10 year plan for pasture improvement could then be developed. Using a map of the farm, categorise the landscape according to key soil types; current pasture species; slope and aspect; and the performance of the pastures in these areas (see the EverGraze Action – Dividing up the farm for grazing management). Highlight areas that are not performing and identify where there are opportunities for improvement. Consider first the potential to improve production, persistence, composition and utilisation through changes to stocking rates, grazing management, landclass fencing and soil fertility. Then consider where establishment of new pastures might be an option (see the section on Renovate or rejuvenate below for further detail on making this decision). Based on the current and desired livestock enterprises, calving/lambing times and stocking rates, how well do the current pastures meet livestock feed demand for both quality and quantity of pasture grown? Where are the gaps (when you are always feeding) and what options are available to fill the gaps? The MLA Feed Demand Calculator can assist in working out the match between feed supply and demand. The EverGraze Feedbase Planning and Budgeting Tool can also help to determine summer and winter feed budgets to identify the extent of the gaps and potential impact of change. See the EverGraze Exchange – Livestock systems for profitable use of perennial pastures for more information on livestock systems. Are there particular environmental issues such as salinity, waterlogging, ground cover/erosion and soil structure that need to be addressed on the farm? Consider both on-farm impact and off-farm impact of groundwater recharge, soil and nutrient loss. Are there pasture and management options to manage these issues? Once you have identified areas in need of improvement, and set your objectives, the next step is to decide on the best course of action to improve your pastures. Pasture establishment is expensive due to input costs, the loss of production while the new pasture is establishing and the need to defer sales or purchase stock to use the extra pasture grown. At the EverGraze Supporting Sites changing from low quality volunteer pastures to well managed perennial pastures cost on average $450/ha (range $263-$757) to establish, including approximately $100/ha of fertiliser expenses. These costs vary significantly between regions – estimated costs in WA are substantially lower (around $150/ha plus fertiliser expenses). Although the investment at the Supporting Sites was substantial, resulting carrying capacity of pastures increased on average 9.4 DSE/ha compared to unimproved controls, and with an estimated average break-even point of 6 years (range 3-10). EverGraze financial case studies for Victoria and Western Australia provide detailed economic analysis for establishment of pastures under different situations (See Pastures Species On-Farm Options). The new pasture must result in a substantial increase in carrying capacity, around 6-7 DSE/ha in 600-800 mm rainfall zones. In lower rainfall regions where pastures are established as part of the cropping enterprise with lower establishment cost, lower stocking rate increases can be profitable. Breakeven points can be shorter where marginal cropping soils are targeted (kikuyu on deep sands, tall wheat grass on mildly salt affected areas). These will often yield large increases in stocking rates, bringing them in line with other paddocks on the farm, with minimal opportunity cost. A larger return will be achieved if the new pasture allows for reduced costs (eg. lower supplementary feeding); or a higher value enterprise ie ewes and lambs rather than wethers, finishing lambs rather than selling stores, mating ewe lambs, or increasing lamb marking percentages by flushing ewes on green feed. Maintaining the same stocking rate and relying on higher performance per head (higher wool cuts, lambing %, and weaning weights) alone is unlikely to be profitable. Allowance must be made to purchase or withhold stock from sale to generate the increased stocking rate. The cost of stock is often greater than the cost of re-sowing the pasture. An alternative might be to run the existing stock on a smaller area of the farm and increase the area used for crops. The overall profitability of the animal enterprise is vital for success. If the gross margin is <$20/DSE, pasture re-sowing is unlikely to be profitable. Conversely, if gross margins are $30-40/DSE, then the payback period from re-sowing might be only 4-6 years. In addition to increased stocking rates, re-sown pastures usually allow higher per head performance due to superior quality herbage and a longer growing season. Gross margin/DSE from re-sown pastures might be 10-20% higher than for the original pasture depending on the quality of the base pasture. In general, saving on seed, fertiliser or lime has only a minor impact on return and payback periods so cutting corners is not advisable. Similarly, changes to interest, taxation and investment rates have relatively little impact on profitability of re-sowing compared to stocking rates achieved and the overall profitability of the livestock enterprise. Persistence of perennials is critical to realising returns on investment. The pasture life needs to be greater than the estimated payback period to make the investment worthwhile. For details on calculating the costs and benefits of pasture establishment, see Investing in pasture improvement. Although in most cases re-sowing pastures at Supporting Sites was profitable, there were also several examples where for pastures which were originally sown to improved species and had become run down, or were based on existing native species in more marginal country, regeneration with fertiliser and/or grazing management was less risky and resulted in a shorter return on investment. It is therefore important to consider whether re-sowing or rejuvenating a run-down pasture is the best course of action. In addition to the points above, the steps below provide a guide for making this decision. Address limitations on pastures first before establishing perennial species. Take soil tests on the range of pastures and production zones across the farm. Correcting grazing management and soil fertility limitations on pastures with fertiliser-responsive species present may result in bigger gains for a smaller investment than starting from scratch with the worst pastures. Also compare the investment to filling feed gaps using tactical measures such as Nitrogen, Gibberelic Acid or supplementary feeding. Identify the problem on run-down perennial pastures. For pastures which have previously been sown to perennials and lost the perennial component, what is the reason for poor perennial persistence? The answer is usually related to one or all of soil fertility limitations, soil acidity, incorrect grazing management, poor seasonal conditions or an unsuited species. Identify the potential for improvement of existing pastures. The potential for improvement will be determined by the existing pasture species, the extent of soil fertility, condition and management deficiencies, and the capacity of the land – bigger gains will be achieved from improving land with a higher production potential. Assess pasture composition in mid spring when species can be easily identified (Making More from Sheep Tool 7.6) or conduct plant counts to determine the current status of the pasture. 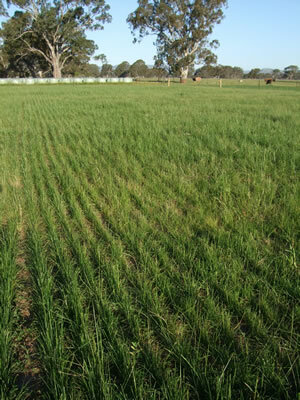 If the pasture is run down as a result of poor seasonal conditions, soil fertility or grazing management, it can generally be rejuvenated if there is greater than 15-20% desirable species, as few as five phalaris / cocksfoot / tall fescue plants per square metre or 10 perennial ryegrass plants per square metre. Species such as kikuyu which spread by rhizomes and stolons have even greater potential to increase from very low numbers. Decide on the course of action. Rejuvenating an existing pasture will involve a combination of soil fertility, grazing management and weed control. Management needs to be tailored to discourage the undesirable species and encourage the desirable species. There is no one “recipe” that will work for all pastures. The EverGraze Nuts and Bolts of Grazing Strategies Exchange and EverGraze Actions for individual species (found under On-Farm Options Pasture Species) provide a guide for manipulating pasture composition under a range of circumstances. Decide on the species to be sown and commit to changed management. Where grazing and fertility limitations have been addressed and there are few or no desirable species present (or a clear need has been identified such as reducing supplementary feed) then full pasture renovation is warranted. EverGraze principles (discussed below) can be applied to select the right plant for the right place and purpose. Consider and commit to management changes that may need to take place to maximise productivity and persistence of the new pasture. Plan the pasture establishment program. The establishment method including elimination of undesirable species, insect pest control, sowing practices, overcoming soil limitations will vary depending on the species, soils and environment however it is invariably critical to success. Recommended guides to planning a pasture establishment program include the Agriculture Victoria Simple Guide to Perennial Pasture Establishment; DPI NSW Eight Steps for Pasture Establishment; the DAFWA Farmnote for Establishing sub-tropical perennial grasses; and the Future Farm Industries CRC Tropical Pastures Series which can be found under On-Farm Options. New tall fescue pastures at the Euroa Grazing Demonstration. 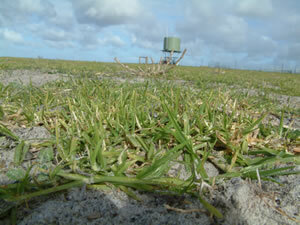 The photo shows a successful establishment resulting from 3 years of preparation with crops. New tall fescue pastures at the Euroa Grazing Demonstration. 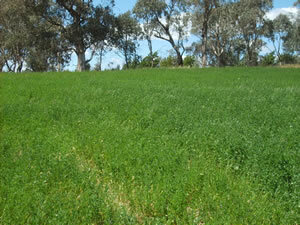 The photo shows heavy silver grass and barley grass invasion from lack of preparation in the years prior to sowing. Selecting the right combination of plants will first involve understanding which species are suited to the climate, soils and landscape. For any particular area, there are only a few improved pasture species that will be persistent and productive. The species for key high rainfall regions in southern Australia are summarised in the regional packages. With a filtered list of species and varieties which match your area, you then need to consider the intended enterprise needs and management requirements. Some considerations for selecting pastures for place, purpose and management are provided below. Selecting the right plant for the right place – what works for your farm? The combination of soils (fertility, soil type, drainage, levels of acidity or salinity), climate (rainfall and temperature patterns and variability), topography (degree of slope) and aspect (north or south facing slopes) across the farm will determine the suitability of species and cultivars for your landscape. Consider these factors in combination rather than individually. For example, soil type can modify the species rainfall boundaries (perennial ryegrass does not persist well on Kangaroo Island even where 750 mm rainfall occurs due to the lack of moisture retained over summer in the gravelly soils). Due to these complexities, it is difficult to generalise across regions about the requirements of different species. EverGraze is developing summary guides for selection of pasture species which will be made available in the regional packages. Also refer to regional research and farmer case studies to help with decision-making. Also ask yourself and your neighbours and local agronomists what has (and hasn’t) worked in the past as this often provides a good guide. To be able to sow species in the most suitable location, paddocks need to be fenced to soil type and land class (land management unit). It is difficult to sow two species in different parts of the same paddock and effectively manage each species. Inevitably, one will be overgrazed and the other under-grazed. A range of programs are available to develop farm maps based on soils and topography so that future fencing, water supply and infrastructure can be placed in the right locations. As paddocks are separated into more uniform areas, pastures can be targeted to each specific paddock. Once you have a list of pasture species that suit your landscape and soils, matching the Right Plant in the Right Place for the Right Purpose is the next step. The capability of pasture species vary considerably in terms of grazing tolerance; autumn, winter and spring growth; late spring quality; response to summer rainfall; ability to control recharge; ability to maintain ground cover; and suitability for fodder production. EverGraze Proof Sites at Wagga Wagga, Albany, Hamilton, Holbrook and Tamworth, together with many on-farm case studies and demonstrations have clearly shown what can be achieved by using a range of summer and winter active perennial and annual plants matched to different landscapes. Production advantages include better matching feed supply and demand, extending the length of the growing season, reducing the impact of poor seasons, capitalising on good seasons and providing higher quality herbage at specific times of the year. Species matched to the right part of the landscape and with the right management also showed that in most cases they could persist for more than eight years. On-farm evidence also suggests that for some species (kikuyu in WA, perennial ryegrass in southwest Victoria, and phalaris in Victoria and southern NSW), persistence for up to 20 years is possible. Having a range of species across the farm can also help to manage animal health issues such as phalaris toxicity or perennial ryegrass staggers, and environmental issues such as salinity and erosion. 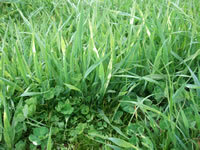 The right combination of pasture species will depend on the issues to be addressed. Regional packages provide recommendations for species which were used on Proof Sites and Supporting Sites to maximise performance of reproductive enterprises. The Feed Demand Calculator is a good tool to examine the current and potential match between pasture supply and demand on a farm. With this tool, the livestock and pastures are detailed and then a graph of the feed demand:feed supply is provided (Figure 1). In the above example, the calculator shows that pasture production (dark green line) in late summer and autumn is well below animal demand (bars). Are there any options to reduce this deficit? In this example, an additional area of a summer active such as lucerne could reduce the amount of feed grown in spring and increase the amount (and quality) of pastures grown into summer-autumn. On most farms, there needs to be a compromise between having the right combination of plants and managing complexity. Having more than three major species (eg. phalaris, lucerne and native pastures) with different growth patterns, grazing management and weed control requirements may become difficult to manage. A second issue is that every time stock move to a different pasture, it takes time for them to accept the new/different forage and for the microorganisms in the rumen to adjust to the new feed. Therefore, it is usually best to maintain significant proportions of the farm under each species to allow the pasture to serve its purpose and minimise frequent changes to stock diet. Perennial species have a number of production and environmental advantages compared to annuals in most high rainfall regions due to their ability to use soil water to depth, hold the topsoil in place, get away quickly at the start of the season and provide quality herbage for longer. However, sown and volunteer annual grasses, crops and legumes usually play an important role either as a component of a perennial pasture or on other parts of the farm for providing winter or summer fodder, in the case of crops controlling weeds prior to perennial establishment, or in the case of legumes, supplying nitrogen to the system. In almost all cases, an annual or perennial legume component is sown with perennial grasses or herbs. 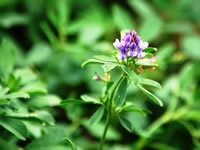 Selection and management of legumes is covered in the EverGraze Exchange “Legumes for temperate pastures”. There is some debate about the value of sowing multiple species in a pasture mix, commonly termed a “shotgun mix”, as a means of dealing with livestock nutritional needs and seasonal and within-paddock landscape variability. There are some circumstances where species mixes are warranted such as where a perennial grass is needed in a lucerne or chicory stand to balance nutrition, reduce the risk of erosion and/or increase winter production (Tamworth EverGraze Proof Site). However, in most cases where different perennial grasses are sown together in a mix, establishment and management is compromised due to differences in growth patterns, feed quality and management requirements throughout the year. A recent literature review conducted for southern Australian pastures (Virgona unpublished) found little or no evidence that having a greater range of species increased animal production. Secondly, a survey of 61 paddocks southern NSW paddocks where a range of species were sown in the previous five years revealed that although farmers had sown on average five species, only two of these species could be found at all. The message is to work out the best species for the target area, sow an adequate amount of this species with the appropriate methods and apply the necessary post sowing management rather than use a “shotgun” approach. Consider what you are trying to achieve from this pasture. Is it a general purpose pasture to maintain a high stocking rate throughout the year, especially in winter and spring? Is it a pasture to provide high quality forage in summer and autumn? Is the pasture designed to use soil moisture in summer and autumn and so reduce soil salinity? Is the pasture designed to provide ground cover and reduce erosion? Is the pasture required to finish lambs, flush ewes prior to joining or provide shelter at lambing? Most plants can meet 2-3 but not all of the above purposes. Producers need to consider which issues are the most important, and select species that will fit the purpose. 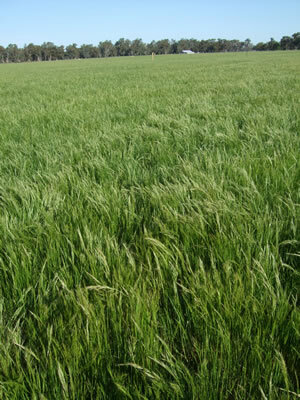 Winter active species such as phalaris, summer and winter active tall fescues, perennial ryegrass, or annual pastures sown with sub clover, are the mainstay of the feedbase for most reproductive enterprises in south-eastern Australia. Their winter-spring dominant growth pattern fits well with the peak demands of lactation, although they tend to lose quality when they flower in late spring and go dormant (or mostly dormant) during summer, and often before young stock have reached target market weights. The length of the growing season and late spring quality can in some cases be extended by selecting grass cultivars which either flower later or respond to summer rainfall. Examples include later flowering perennial ryegrass or summer active tall fescue (see Hamilton EverGraze Proof Site) which are suited to higher rainfall areas or valley floors which retain moisture for longer. Summer active species including lucerne, chicory and plantain maintain feed quality late into the growing season and respond to summer rainfall providing high quality out of season green feed. 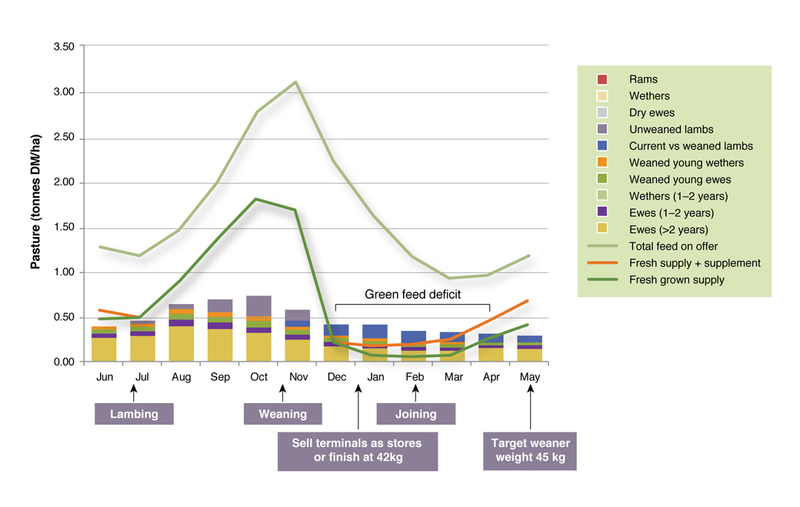 The additional green feed can be used for a range of purposes including finishing growing stock; reducing supplementary feeding costs of ewes or weaners; early weaning cattle; or increasing the ovulation rate of ewes (results from the Wagga Wagga EverGraze Proof Site showed that grazing ewes on lucerne for 7 days prior and 7 days during joining can increase the number of lambs marked by 10%). Across all EverGraze Proof Sites, the addition of summer active perennials increased opportunities to capitalise on good years by finishing lambs and/or reduced costs of supplementary feeding costs under conditions of a failed spring (see key messages on summer actives at Hamilton, Albany and Wagga Wagga). The higher summer activity of species such as lucerne often comes at a cost to winter production, and summer active herbs and legumes tend not to persist for as long as well adapted grass perennials. These species also have very specific soil and drainage requirements so are often not suited to all areas of the farm. Summer and winter active perennials are therefore best run as a system, with the high winter production of grass species off-setting the lower winter production of summer actives. Having a proportion of summer active perennials enables better spring utilisation of the grass species while holding quality to be grazed by young or reproductive stock later in the season. The optimum proportion of summer active perennial in the system is dependent on the region and the livestock system. For example, at Wagga Wagga, in a system with a higher proportion of lucerne in the system (40% compared to 20%) the highest margins were achieved with a later lambing time, higher ewe numbers and joining ewes to terminal sires to increase the kg lamb sold. Kikuyu is a subtropical species that can be considered either a summer active or special purpose pasture in temperate coastal regions of Gippsland in Victoria, southern WA and northern NSW. Research at the Albany Proof Site showed that while the nutritional value of kikuyu is not sufficient to grow out lambs, including it in the system can significantly reduce supplementary feeding costs by maintaining ewes through summer. Kikuyu has been widely adopted across southern WA. This is primarily due to its ability to persist under heavy grazing pressure and its ease of establishment. It is also very acid tolerant (pH >3 CaCl2) and will tolerate substantial waterlogging. When considering sowing pastures in a particular area of the farm, it is important to understand the potential need to control recharge (leakage of water below the root zone causing salinity and/or waterlogging), and ground cover. The best species for managing recharge are those that a) respond to summer rainfall, b) are deep rooted, and c) maintain high density throughout the year. Key examples of species which fit these criteria, where they persist, include lucerne, chicory and kikuyu. Deep rooted winter active perennials such as phalaris and tall fescue will reduce recharge compared to annual species but are not as effective as summer active plants. Regional packages provide further information on managing recharge in each region. Most introduced and native perennial grass species are capable of maintaining ground cover above benchmark levels (70% for flat or undulating country and 90% for steep hills) provided they are managed to persist. However, summer active herbs and legumes such as chicory and lucerne are more upright in their growth and can expose high proportions of bare ground. These species should either be avoided in high-risk erosion areas or be sown with a companion grass species. Tamworth EverGraze Proof Site showed that ground cover, runoff and resulting soil loss could be managed using lucerne-grass mixtures. For sandy soils prone to wind erosion, such as those found in WA, Kangaroo Island in SA or East Gippsland in Victoria, kikuyu offers an excellent solution for maintaining ground cover and preventing wind erosion, even under heavy grazing through summer. Experience in WA has shown that it is quite frost tolerant however its growth is greatly reduced when frost events occur. In the eastern states it appears that the combinations of cold wet winters, frequent frosts and heavier soils (more suited to temperate perennials) have severely limited the areas suited to kikuyu. Lucerne and kikuyu are effective for controlling leakage of water below the root zone (recharge). Once the right plants have been selected and placed in the right part of the farm for the right purpose, the final decision is the management to ensure productivity and persistence. This section summarises management of pasture species rather than covering overall grazing management fully discussed in the Nuts and Bolts of Grazing Strategies Exchange. Two important considerations are soil fertility and grazing management. Soil fertility has a large impact on persistence, production, composition and nutritive value and hence animal production and economic return. Unless soil fertility is managed, undesirable species such as bent grass, serrated tussock, onion grass, silver grass etc will out-compete the sown species. An example of how available phosphorus can effect species composition and production is provided in Table 1. Soil testing is crucial to determining fertiliser and amelioration programs. It is common to have adequate and even surplus available phosphorus on some parts of the farm while other areas can be deficient. This is highly dependent on potential plant growth and stocking rates (rate of removal). On native pastures at the Orange EverGraze Proof Site in the Central Tablelands of NSW, it was found that despite having exactly the same fertiliser history, in the area of lowest production (4.6 tonnes DM/ha/annum), Colwell phosphorus was 55 mg/kg while in the area of highest production (9.9 tonnes/ha/annum), Colwell phosphorus was 21 mg/kg. Low phosphorus is the main soil fertility constraint for eastern Australia. However, in particular areas, other essential nutrients such as sulphur, potassium and trace elements must also be considered, together with other constraints such as pH, waterlogging, salinity and sodicity. Some perennials such as lucerne and phalaris will not tolerate acid soils where aluminium levels are usually high. If considering using these species, soil pH and aluminium levels in the topsoil and subsoil should be checked and either lime applied or other perennials such as chicory or tall fescue be used instead. Grazing management needs to be designed for the particular perennial species and there is no “one size fits all” grazing system. Full details of grazing management for persistence and production can be found in the EverGraze Nuts and Bolts of Grazing Strategies Exchange and in EverGraze Actions for individual species. A summary for key sown perennial species is provided below. Phalaris Rotational grazing at 3-4 leaf stage, especially rest in autumn. Utilise spring growth to maximise tillering and prevent clumping. Allow first year or low density stands to set seed to establish summer dormant tiller buds in late spring. Does not recruit from seed due to high ant predation. Perennial ryegrass Rotational grazing at 3-leaf stage, can tolerate some set stocking. Density can be increased by allowing to flower and seed. Summer active (Mediterranean) tall fescue Rotational grazing at the three-leaf stage. 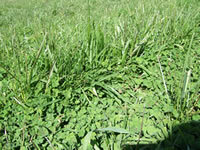 Heavy grazing, fast rotation or topping in spring to maintain quality and tiller density. Summer dormant tall fescue Rotationally graze at the three-leaf stage. Heavy grazing early in spring to utilise quality before seeding. Topping will extend the period of quality feed at the end for the growing season. Cocksfoot Rotational grazing for persistence and prevent clumping. Remove stock quickly after grazing green leaf in summer to prevent damage to the crown and allow recovery. New summer dormant cocksfoots appear to tolerate heavier grazing. Lucerne Rotational grazing with approximately 6 weeks rest between grazing. Manage weeds with winter cleaning every few years to maintain persistence, however allowing some degree of annual weeds will increase winter production. Chicory Rotational grazing. Maintain plant height >5cm. In sparse stands, recruitment can be achieved by allowing seed set and trampling by animals if rainfall occurs at the right time. Kikuyu Tolerates set stocking or heavy rotational grazing. Graze heavily through spring and summer to allow annuals to establish. Can be over cropped with canola or cereals if rainfall is sufficient. The management style of the owner/manager needs to be considered when selecting species for the farm. Depending on the soil conditions and environment, perennials can benefit from specific grazing management to encourage their persistence, growth and feed quality. Perennials will usually benefit from a system that allows a recovery period after grazing so that the plant builds reserves, Kikuyu is one of the few exceptions to this however it has its own requirements to get the best production. By using the EverGraze principles, investment in pastures can be targeted to give greater returns over a shorter time period while also addressing natural resource management, risk management and lifestyle objectives simultaneously. While this Exchange provides a guide to the principles, regionally specific information and examples provided in the regional packages should be referenced for making decisions under specific scenarios. 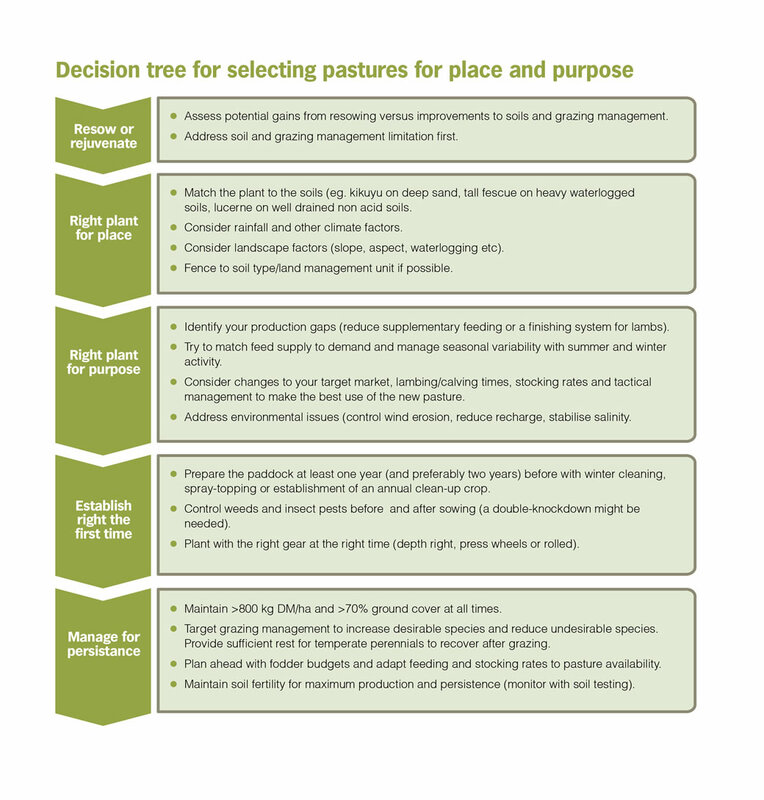 Decision Tree for selecting pastures for place and purpose. EverGraze is a Future Farm Industries CRC research and delivery partnership. Information in this Exchange was developed using information from EverGraze and other research. Geoff Saul, Productive and Sustainable Agricultural Services, Port Fairy, Victoria. Kate Sargeant, EverGraze Project Leader, formerly Agriculture Victoria, Benalla.